Adam Nevill has been called “Britain’s answer to Stephen King” (The Guardian)—a title that’s definitely well deserved. 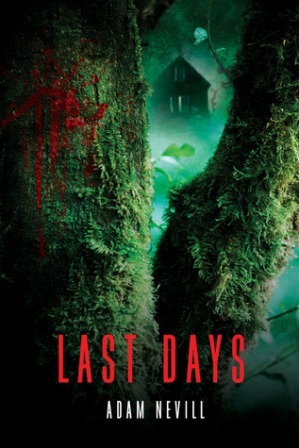 In fact, his newest horror novel, Last Days, gave me more chills than anything I’ve read of King’s. An unrelenting labyrinth of dark secrets and supernatural terror, Last Days is a page turner from the prologue to the last page. Independent film maker specializing in the bizarre and bloody, Kyle Freeman’s life has already descended into a financial nightmare. Deeply in debt, he can’t believe his luck when an offer comes from Maximillian Solomon, CEO of Revelation Productions, to do a documentary for the sum of one hundred thousand pounds. Pre-production has already been done: the locations scouted, the interviews scheduled, the travel arrangements booked. Kyle can pick his own crew and shoot the film in the way he pleases—guerilla style with just his buddy Dan as cameraman and his go-to editor Finger Mouse. Even though Max’s company has been known for life-affirming, self-help products, this project will be a departure: the inside story of an infamous seventies cult called the Temple of Last Days. Its leader, Sister Katherine, ended her reign in a bloody night of murder, suicide, and alleged supernatural activities. The subject is right up Kyle’s alley; the only drawback is that he and Dan must go to six locations in three countries and shoot the entire film in eleven days. Breakneck pace aside, the deal’s too good to pass by. From the first interview, on the first day of shooting, the prospects grow sweeter. Kyle and Dan begin to realize that they may have stumbled into the story of a lifetime—not just the rumor of the supernatural, but the real deal. Racing from London, to France, to the a desert compound in Arizona, to an interview with one of the last surviving cult members in Seattle, they soon understand, though, that one hundred grand won’t come close to covering the price they may pay for unraveling the secrets of the Temple of Last Days. Those they interview die or come close to death. It’s soon evident that what Max Solomon has told them only skims the surface of his knowledge of Sister Katherine’s dark dealings. The old presences that the cult called forth—the Blood Friends­—are once again active, reaching into their dreams and clawing into their lives. Last Days will get under your skin quickly and make you want to read the whole book in one sitting, so plan to set aside some time to indulge that impulse and read through the night. Be forewarned though: Nevill’s story will send enough chills up your spine that you may want turn up the heat and leave all the lights on.